JERUSALEM (CNS) — The Council of Religious Institutions of the Holy Land issued a strong condemnation against an early morning arson attack on the Benedictine Church of the Multiplication at Tabgha on the Sea of Galilee on June 18. 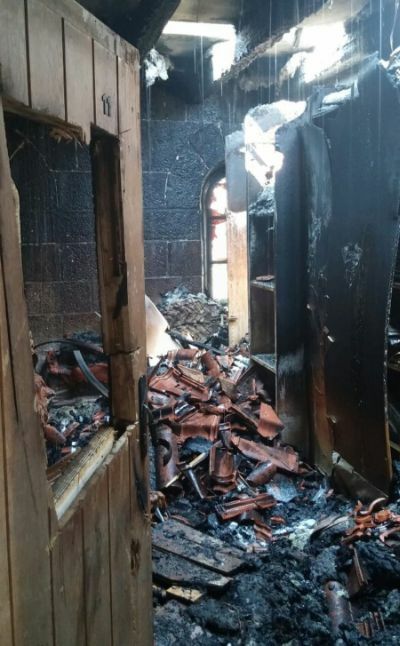 The CRIHL, which is made up of the Chief Rabbinate of Israel, the Heads of the Local Churches of the Holy Land and the Ministry of Islamic Waqf of the Palestinian Authority, said they were outraged by the arson and vandalism. Firefighters were called at 3:30 a.m. to extinguish the fire, which destroyed the roof and damaged a storage room, church offices and a prayer room. Wadie Abunasser, a church spokesman, said the blaze caused millions of dollars in damage. Graffiti scrawled in red paint in Hebrew also was found at the site. It read, “False idols will be smashed,” which is part of the “Aleinu,” a prayer said three times a day by religious Jews. An elderly Benedictine monk and a young volunteer were treated for light smoke inhalation injuries, according to the Latin Patriarchate of Jerusalem. The church is built on the spot where Christian tradition holds that Jesus miraculously multiplied five loaves and two fishes to feed 5,000 people who had come to hear him preach, according to the Gospel of Mark. The church is known for its mosaics depicting the miracle and is one of the highly visited pilgrimage sites along the shores of the Sea of Galilee. In April 2014, the CRIHL issued a similar condemnation for an attack against the Church of the Primacy of St. Peter, also located on the shore of the Sea of Galilee in Tabgha, and of a mosque in the northern Israeli Arab village Fureidis. This latest incident does not promote peace among peoples of all religions, and it discourages pilgrims and tourists from visiting the Holy Land, the Latin Patriarchate said in a statement. Police said 16 religious yeshiva students from the West Bank who had been camping in the area were arrested the morning of June 18 in suspected connection to the attack. They were later released. Israel is considering labeling the arson as a terrorist attack, according to press reports. Though he said the perpetrators of such acts should be brought to justice, he emphasized the urgency of the need for education toward tolerance to prevent future attacks. The Benedictine superior in Israel, Father Gregory Collins, told Israeli President Reuven Rivlin, who called the priest to express his condemnation of the attack, that 5,000 pilgrims visit the church daily. The site was to be closed for at least three days. “I was shocked and saddened to learn this morning of the fire at the church at Tabgha. Such terrible desecration of an ancient and holy place of prayer, is an attack on the very fabric of life in our country — where people of different faiths seek to live together in harmony and mutual tolerance and respect,” Rivlin said. He also said he understands it is a small group of people who are carrying out such attacks, which he described as attacks on Israeli democracy.